All Saints’ theatrical productions, complete with elaborate sets, colorful costuming, and talented performances, are always highly anticipated and often sold-out. Fully-staged, our Shakespeare and Spring Musical productions combine all areas of the performing and fine arts, and give students the opportunity to perform for a community audience. 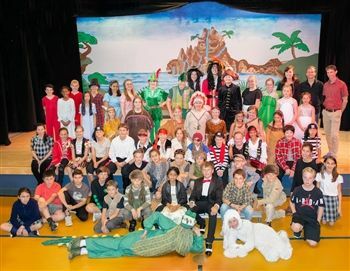 Students participate in performing roles, directing, set designing and working as backstage crew. Additionally, our students participate in dramatic performances in chapels throughout the school year, at the Spring Tea, and at the Student Talent Show. Now in its 39th year, the All Saints’ Spring Musical is one of our school’s most beloved events and traditions. The majority of students in grades 3 through 8 participate in some way, either acting, singing and dancing, working on set design, lights, sound, makeup or stage crew. Each play is a never-to-be-forgotten event – for cast and crew, as well as the audience! This year's musical PETER PAN is a wonderful show, sure to delight kids and adults alike Join us and fly to Neverland on April 11 at 10am, 12 at 10am & 7pm, and 13! at 7pm. Follow this link to order ticket. And as always, alumni and students are admitted free of charge! Past shows include The Sound of Music, The Music Man, Peter Pan, Annie, Tom Sawyer, The Wizard of Oz and Oliver!. While it is highly unusual for a middle school to produce an entire Shakespeare play complete with music, dance, sets, period costumes, and on occasion, pyrotechnics and juggling, All Saints’ Day School has accomplished just that for twenty-eight years. Each fall, the middle school students participate in one of William Shakespeare’s comedies, such as A Midsummer Night’s Dream, As You Like It, The Tempest, Twelfth Night, and Much Ado about Nothing. Smiles are ear-to-ear when the Primary Players take the stage. This annual musical production, performed by the 1st and 2nd graders, provides wonderful opportunities for the younger members of our school to express themselves creatively and also develop confidence in speaking and performing for an audience. Many an actor was born on the Primary Player stage! This year our Primary Players entertained the community with Something Funny Happened on the Way to Morningtown, an original musical, written by our music director Pete Sibley. Our little Saints guided us to the magical lands of Dreamland and Morningtown where four friends discovered hidden talents and courage they didn't know they possessed.